A helipad is a helicopter landing pad and designates a safe, identified landing area that is on an appropriate surface and free from obstacles. 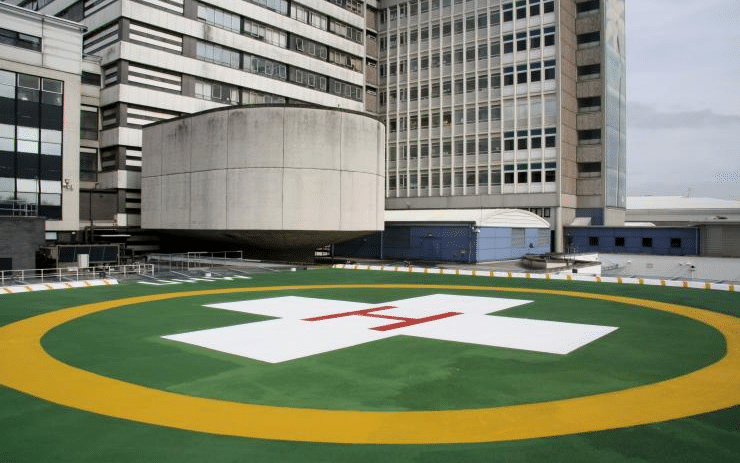 The design and construction of each helipad will vary, determined by the weight of helicopters that will make use of the site and the purpose of those helicopters, as well as safety considerations and space and cost restrictions. Helicopters come in many sizes, with numerous uses, whether for civilian or military purposes. A military base with high helicopter use, for example, will need helipads capable of handling large volumes of traffic, for a variety of purposes, and a range of weights. A helipad on top of a building for use in case of evacuation, though, will likely have a reduced build requirement, as it will not be intended for regular, heavy use, or to accommodate a landing by a heavy helicopter. At its most basic, a helipad could simply be a temporary, cleared, level area. A semi-permanent or permanent helipad, though, will have a purpose-built surface, commonly concrete, designed to withstand the load applied by the helicopter. The load is in a pattern determined by the design of the landing gear and the surface contact area of each tyre and the load bearing specifications will need to be able to withstand a forced landing. The frequency of use will also need to be factored into the required strength of the surface. Whilst the helipad surface must be strong and resilient, the subsurface on which it stands must also be robust. If found to be substandard, this layer will need stabilising and treating before the helipad surface is built. The landing site will need to be marked out so it is visible from the air, usually by a large circle with an “H” in the centre. Often helipads on buildings will also have a number to indicate the maximum takeoff weight of a helicopter, in units of thousands of pounds. This may also be accompanied by a second number that indicates the longest permissible length in feet of a helicopter that can use the pad, from the tip of the main rotor to the tip of the tail rotor. Safety demands mean that it must be possible for pilots to be able to determine wind direction on taking off and landing, so each helipad will require a windsock, flag or smoke close to, but not within, the helipad area.